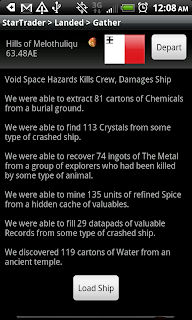 A brand new version of Star Traders RPG has been uploaded to the Android Market! So far so good, really liking the new military bases :) My only problem is that I'm getting a FC everytime I return to Cadar Prime after completing a contract. Help me out if you can and press "Report" on that Cadar Prime crash. I'm trying to figure it out! When I die im getting an fc. I am playing basic lvl. Mytouch 3g. I love the new military bases. Could be cause my phone has too much stuff on it (slows down)?